Anti-Brexit activists have launched a bus tour, in the style of the Vote Leave campaign, which will travel around the country asking people if the cost of leaving the EU is justified. The total amount that campaigners – which include Chuka Ummuna and Gina Miller – have used is based on leaked analysis showing that even if Britian does get a trade deal, growth would be down 5% in the next 15 years, equating to £2,000 million per week. 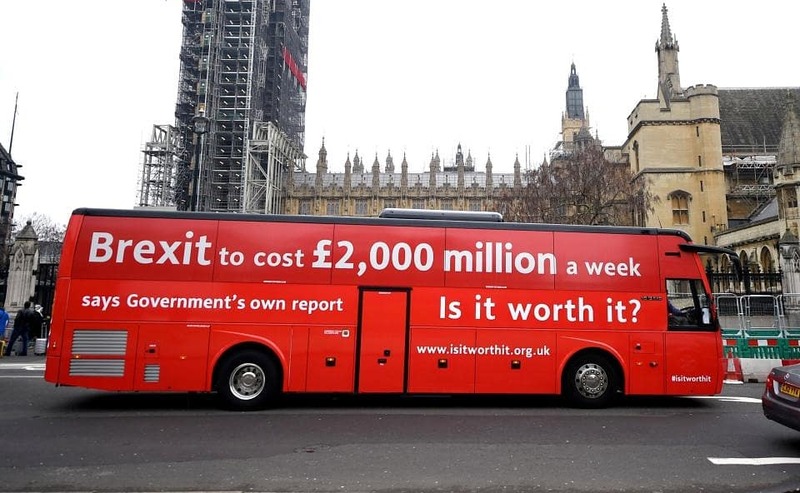 The copy on the bus isn’t the snappiest and £2,000 million is a slightly unusual figure i.e most people would think of that number as £2 billion – why not say that? Also, there have been so many photoshop parodies of the Vote Leave bus that it’s no longer a particularly arresting or surprising image; people glancing at it on social media or in the papers will probably not register it as a different bus. They’ve also created some fake cash featuring Boris Johnson’s face and some copy saying “Bank of Brexit Lies” and “three hundred and fifty million pounds”; feels like had this been the main execution it might have had more media impact.